Here is a story I’ve written for Literary Lion, hosted by Laura at I Smith Words. Laura has interrogated Literary Lion and he has delivered the following word for the prompt – “merry”. Now we have up to 400 words to write our story. My story is pretty mad even for me this week, so don’t be expecting a clever plot :-). Merry wasn’t. Merry, that is. Not living up to his name. In fact he’d change his name to “Grumpy” if that weren’t already taken. Few people are aware that the Seven Dwarfs line-up has changed over the years. Merry was an original. Doc, Grumpy, Happy, Merry, Bashful, Sneezy and Myxomatosis. “Merry” was deemed too confusing (given “Happy”). “Myxomatosis” was a non-starter. They were quickly replaced. 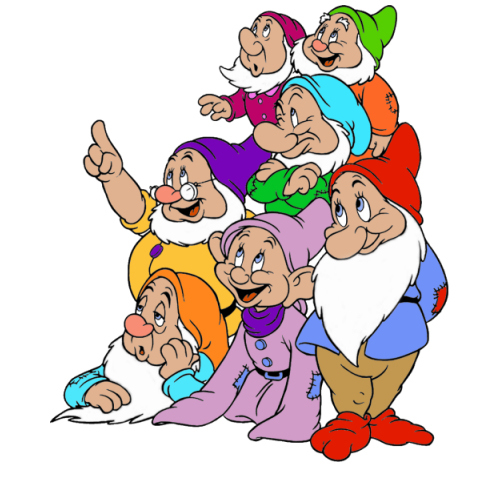 All the other dwarfs had made good lives for themselves. New stories, repeats, remakes – they were living the high life. Merry had nothing. A dank bedsit, no job… was it any wonder he wasn’t merry? Even his showbiz friends had made it big. Okay, so Bambi had a drinking problem and Snow White had spent six years working in a meth lab to fund her crack habit, but she’d cleaned up her act and it had only helped her career in the long run. What did poor Merry have? It came as no surprise when one day he snapped, strapped his shovel to his back and smashed his way into the studio, swinging his pick axe left and right. Chaos ensued. Puff trampled the Ice Queen in his panicked attempt to escape. Cruella tripped over a Dalmation and took a shovel blow to the head. Road Runner ran into a wall. Visiting super-villain Ming the Merciless, Lord of the Universe, Destroyer of Worlds had an embarrassing panic attack in the corner. In the end it took the concerted efforts of Alice, Aslan and the entire cast of “The Wizard of Oz” to bring him down. And so now Merry lives in a padded cell, pumped full of exciting pharmaceuticals. And thanks to those pharmaceuticals, Merry finally is. Merry. I am glad it all worked out for Merry… I was shocked to hear of Snow White’s past! Enjoyed! And they all lived happily (merrily?) ever after. Print the legend. It could be a blockbuster! I think I’ll give Spielberg first refusal. It’s quite startling to learn about the stars’ private lives sometimes. You just never know! So glad that Merry eventually found his true personality, although the means to that end were perhaps a little controversial. I presume that Hollywood is now functioning as usual? A great read,Ali. I’m glad you liked it! Thanks for hosting.